Need a gift but you don’t know his size? Or don’t know what to give the person who already has everything she needs? Consider a tribute plaque in Greentopia’s FlourGarden. 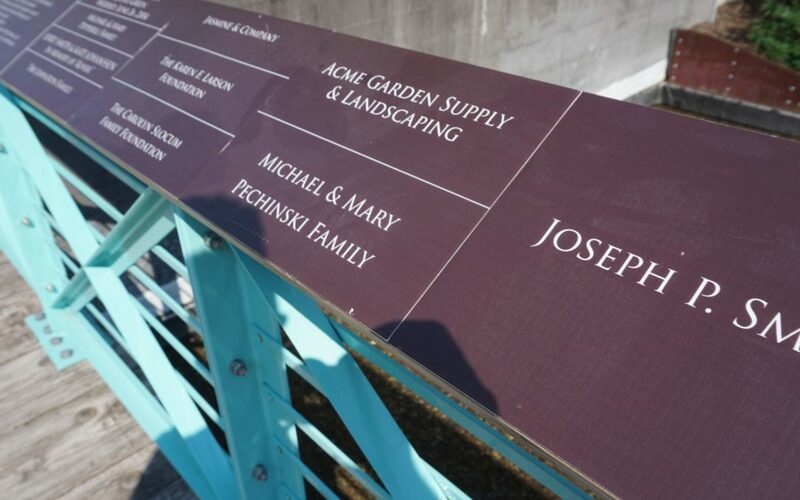 For as little as $100 for a single name, we can have your loved one’s name etched on a space in the FlourGarden’s Donor Recognition Wall. For $250, you can have two lines of poetry inscribed or create a memorial or commemorative dedication. Or just go whole hog and dedicate an entire section of the garden for $25,000. We’ll accommodate all budget sizes! These laser-etched metal plaques will be attached to railings along the FlourGarden on Browns Race in the High Falls District. (Gifts of $25,000 or more get their own free-standing signs in the garden.) Besides honoring a loved one, you’ll be supporting our mission of creating vibrant public realms in sustainable, environmentally sensitive ways. And you get a tax deduction to boot! Visit this page to find out more and to access our on-line order form. And happy giving.